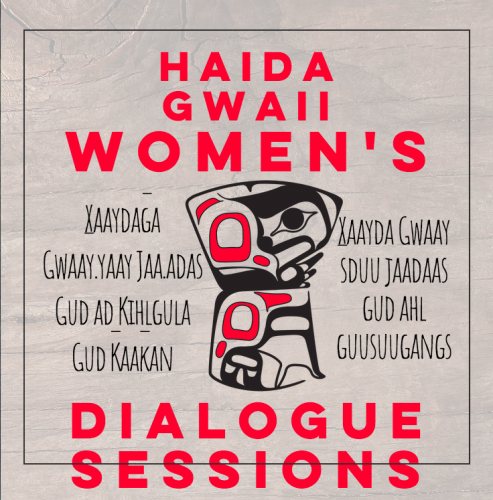 The Skidegate Band Council, Old Massett Village Council, and Council of the Haida Nation are excited to present the Haida Gwaii Women’s Dialogue Sessions (HGWDS)! The purpose of the HGWDS are to strengthen the leadership of Indigenous and non-Indigenous women of all ages to create positive change that enhances the well-being of women, families, communities, and Nations. This project will take place over three separate weekends on Haida Gwaii (see dates below). These dialogue sessions include panel discussions, presentations, art performances, small group working tables, experiential decision-making activities, workshops, and open dialogue. Each session is unique, with an agenda tailored to the group(s) of women that are participating, including such experiences as panel discussions on Women in Business, working tables to address issues impacting women, knowledge-sharing activities, and much more. Furthermore, if anyone knows any young women interested in leadership, we are looking for 15 young Haida women to facilitate World Cafe style working tables during the Haida Women’s dialogue session and Heiltsuk & Haida dialogue session, and 15 young women to facilitate World Cafe style working tables during the All Women’s dialogue session. If you have any questions, comments, or would like to know how you can contribute, please feel free to contact me through phone or email, or stop by the Skidegate Band Office.